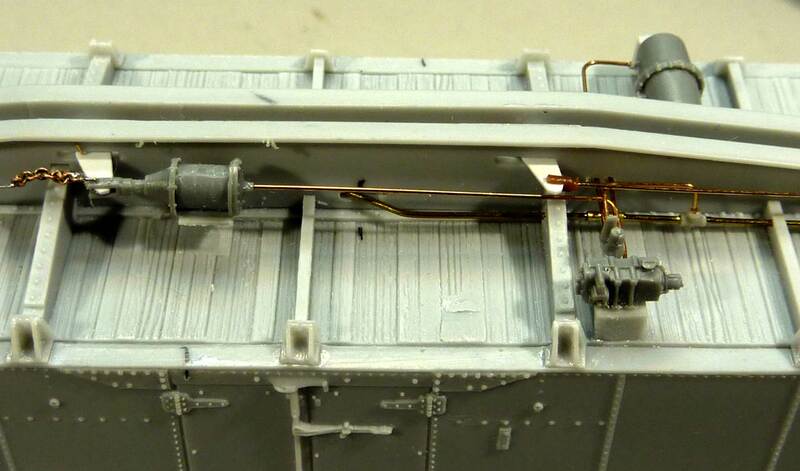 George Toman shares an update on the latest Resin Car Works kits that are on his workbench. Here’s George with some details. Two Resin Car Works Santa Fe Refrigerator Department Reefers (Kit 10.0) are nearing completion. One will have the round Preco fans as used on class RR-36 and -40 cars. 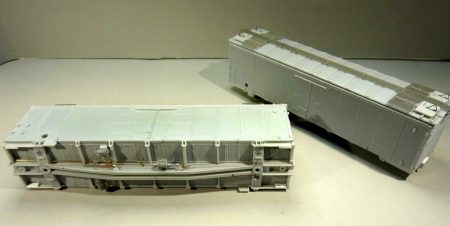 The other model will get the Square Preco fans as used on RR-35 and -39 cars. That’s where the holes are on the left side near the side sill. I followed RCW basic construction instructions with a few changes as follows. 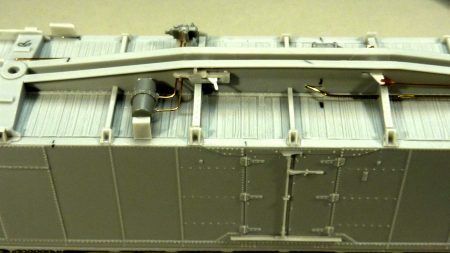 I really enjoy underframe details and added the airline using 0.019-inch diameter Detail Associates wire. I drilled both the crossbearers and crossties and made elongated slots in the centersill for the airline to cross over. I used a 3D printed Tee to connect the airline to the three way valve. New brake clevises were fashioned from styrene and a adjustment rod was put on the one end that passes through the Royal F Type slack adjustor. 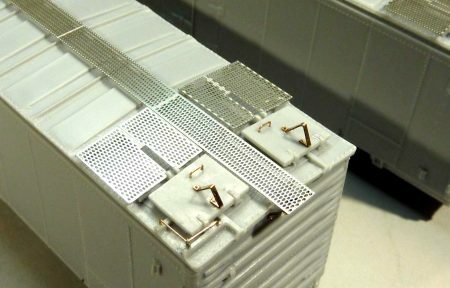 For the ice hatch covers, I made a drill guide template to drill holes for 0.010-inch brass rod that pins and locates the photo etched hatch cover angled brackets. I found this method kept them all the same shape and nicely aligned. One addition to the model was the running board support that is a Yarmouth Model Works photo etched version, instead of using styrene as per the instructions. The corner grabs are 0.010-inch brass formed in an L-shape with the corner support eyelet made from 0.008-inch wire and soldered in place. A Kadee Ajax brake housing and wheel need to be installed, plus the bell crank and a Precision Scale relief valve. The ladders all have had the rungs reduced and filed down to 0.011- to 0.012-inch diameter. As per the painting suggestions the side ladders will be added after painting the sides first SF Orange and the roof and ends Black. I should have these in the paint shop in the next couple of days. Once all painted and lettered, I will post a follow up photos. I plan to display these at the upcoming RPM Chicagoland, October 18-20. I have found this to be a well engineered kit and enjoyable to build. George, I always love your work, and look forward to seeing it in person at Lisle this year! Minor point: The company that made those fans was named Preco (Pacific Railway Equipment Company), not Precor. Looks like a great model George.